What happens when you have a dynamic website or service that requires quick, and sometimes multiple, changes to go live? You test, you freeze the website, you implement changes, you test, you advertise, you break something, you repeat. While a small site that only sees small amounts of traffic can deal with these issues without a ton of impact, if you're a large company or have a website with continuous traffic, having these issues pop up can be detrimental to your performance. On top of that, it can get expensive if your core team is spending all of its time fixing *gestures broadly* things. That's where something like Platform.sh comes in to play. Platform.sh helps with the building and deployment of a variety of things to make sure your business and web presence keeps chugging along while you focus on things other than endless lines of code. I had the chance to speak with Fred Plais, CEO of the company, to discuss the service, learn a bit about DevOps, and what inspired the creation of the company. Care to introduce yourself and your role with Platform? I’m the co-founder and CEO of Platform.sh. I am an entrepreneur, and I have been building digital products for almost 20 years. My role at Platform.sh is to lead the strategy, and ensure we deliver on the mission we set for ourselves and deliver value for our customers. My job is also to create a great work environment so that the teams can thrill our customers and take responsibility. What inspired the creation of Platform? Platform.sh was inspired by our own needs at first. Our team came from an enterprise ecommerce background, and we were challenged by traditional development and production workflow tools and processes. Most of the ecommerce merchants we were working with want to be agile and release frequently, but the reality is highly different: they “freeze” their sites for long periods at the most critical times of the year–Black Friday for example–and prevent deployment of new features during those times, out of fear they’ll break production. Generally, they are slow, can’t match their competition’s initiatives, and cannot implement efficiently the “growth hacking” techniques they talk about all the time. And the cherry on top: development teams also spend more and more of their time these days building and maintaining things that aren’t core to what drives value for their organizations. Things like continuous integration, container management, monitoring, etc. We built what would become Platform.sh to help us and our customers move faster, and focus on business value, with more confidence that we could make changes even at critical times to stay in front of the market. In just a couple of sentences, what does your business do? You could think of what we do as DevOps-as-a-Service. 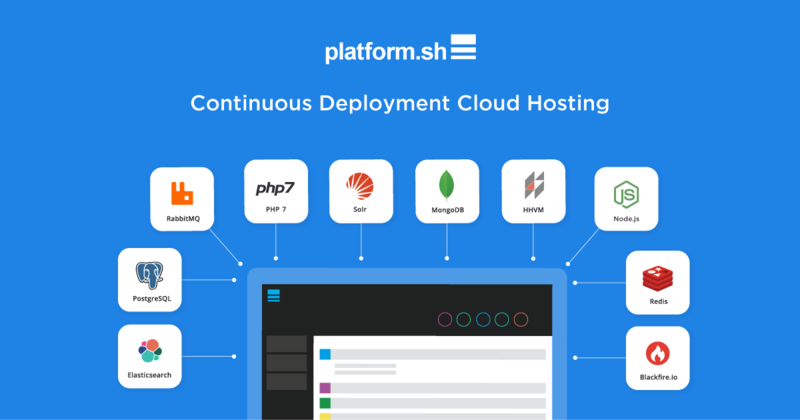 We call Platform.sh “The Idea to Cloud Application Platform” because it simplifies the path between development teams writing code and that code being live in production, delivering value for their organization. Platform.sh provides the tools for teams to build, run, and scale their applications from end to end, and move their focus from operations and infrastructure to developing features for their customers. Organizations using Platform.sh see up to 40% improvement in developer productivity, meaning they're improving their time to value and eliminating ops tasks and costs. How do we do it? Platform.sh enables dev teams to manage their infrastructure and workflow with the same tools they know and love for managing code. Platform.sh extends git, the distributed version control system, so that every branch of the application–for a new feature, bugfix, developer, etc.–creates a perfect copy of the production app, data and all, instantly. When the work is done, it can be seamlessly merged back to production, with confidence, because it’s tested in a perfect replica. Would you consider yourself a hosting provider? Or is that term not big enough for what you do? When people think of hosting, they often think of the last step in a development pipeline–going live into production. We believe that in order to build a scalable application–to deal with heavy traffic, many instances of an application, or large dev teams–production needs to be tightly linked to the development pipeline, so that dev teams can take responsibility and accountability for application delivery, and launch new features and improvements whenever the business needs them, instead of when technology allows them. Many organizations spend a considerable amount of their technology team budget on “Ops” or “DevOps” to build workflows that enable this culture. Platform.sh provides this end-to-end approach to building, running and managing web apps as a service. Our platform unifies tests and production in a unique way. Who is it for? Startups and those looking to scale, or for established enterprise organizations? Our client roster is diverse. We have Fortune 50 organizations that use Platform.sh to build and deploy apps globally, from North America to China. We have partners like Magento Commerce (an Adobe Company) and Symfony SAS, the dominant PHP framework, and Orange, France’s largest internet company, who have built Platform.sh into the core of their Cloud businesses. We help entrepreneurs get started, and transform their new idea or existing software into a scalable SaaS product with our ability to white-label our solution. What is a continuous deployment process? What benefits are there with this type of process? Continuous deployment links the release of software to triggers within the development process, automating the deployment into production. For instance, when a developer makes a change to code, that change would trigger a series of tests (continuous integration), then the continuous deployment process would automate the packaging and launch of the new code and any services (databases, etc.) needed to run it in production. Organizations that run continuous deployment effectively eliminate the concept of “releases” meaning that as code is improved, it’s automatically delivered, allowing for smaller increments of change whose impacts are easier to measure, and give immediate feedback to developers and product teams. Could you give a scenario where someone could benefit from changing their current services to Platform? The downside of continuous deployment is that it can be challenging and expensive to implement. It requires expertise in building and managing cloud infrastructure (IaaS), continuous integration (CI), continuous delivery (CD), container orchestration, code management, and more, and requires knitting together multiple tools and grappling with their idiosyncrasies. Platform.sh reduces continuous deployment to a few lines of configuration. You can take your application, written in any combination of languages like Python, Java, PHP, Node.js and more, add built-in services like MySQL, Redis, MongoDB, Elastic, etc., and have those automatically “containerized” and deployed to multiple cloud services we partner with. Organizations don’t have to re-tool their application to be stateless, or split into microservices before they’re ready, and they can rely on a global deployment and support model that comes from a company with a distributed team with experience making software run worldwide. We’re excited about 2019–we’ve got big announcements coming about key capabilities to deliver DevOps at scale for our customers and partners. Here I’ve talked mostly about what Platform.sh does in the context of one application. The real power of Platform.sh is in extending our “DevOps-as-a-Service” concept across the management of fleets of applications. In 2018 we announced our white-label SaaS factory solution that helps entrepreneurs launch and manage dozens, or hundreds, or thousands of applications on Platform.sh. We’ll be extending that capability with advanced fleet management tools for enterprise, more cloud infrastructure choices beyond our current support for AWS, Azure, and Orange, and continued growth of our fully distributed global team.